It was a successful day all round for the remaining Latin American nations left in the FIFA Beach Soccer World Cup yesterday, as all three triumphed to book their places in the semi-finals. Mexico continued to confound critical opinion by defeating Spain 5-4 in the opening quarter final. A Ricardo Villalobos penalty turned out to be the winning goal after the two nations swapped the lead at will for the majority of the game. Villalobos also scored Mexico's first of the game, with further strikes from Oscar Gonzales, Morgan Plata and Moises Salazar levelling the game at 4-4 prior to Villalobos' penalty winner three minutes from time. Mexico will take on Uruguay in the semi-finals, after last year's losing finalists made easy work of Nigeria. Goals from Matias, Ricar and Parrillo gave Uruguay a comfortable lead and although Nigeria rallied late on they could only score one, leaving the final score at 3-1 to Uruguay. In by far the most open game of the quarter finals, Brazil defeated Portugal 10-7 to secure their semi-final berth. 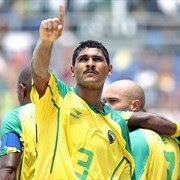 A hat-trick for Buru, combined with double strikes from Sidney, Andre and Daniel, and a single goal from Bruno were sufficient for Brazil to overcome their colonial ancestors on the Copacabana beach.